What felled the mighty ancient kingdom of Anuradhapura? Was it foreign invasions or did the ancients and their kings abandon their homes and palaces because they could not face the onslaught of swarms of tiny mosquitoes, bearing with them deadly malaria? Or were they both? The answer lies buried in the sands of time, but more than 2,000 years later, Sri Lanka has been able to battle and defeat these mosquitoes, in the wake of which has followed elimination of malaria which has plagued this country for aeons. This victory has been held up as a model for the world, with none other than the Director-General of the World Health Organisation (WHO), Dr. Margaret Chan herself presenting the certificate on elimination to Health Minister Dr. Rajitha Senaratne in the presence of the Regional Director of WHO’s South-East Asia Region (SEAR), Dr. Poonam Khetrapal Singh. The other 10 Health Ministers of the SEAR nations were among the distinguished gathering which witnessed the event on September 6 in Colombo, while tributes flowed in to Sri Lanka for this “major public health achievement”. While the malaria elimination certification was celebrated with much fanfare during the 69th Regional Committee Meeting of SEAR, the ‘foot soldiers’ of the Anti-Malaria Campaign (AMC) under the ‘command’ of current Director Dr. Hemantha Herath, former Director Dr. Risintha Premaratne and a long line of earlier leaders, who fanned across the country to their job with commitment and dedication, will continue to plod the weary-mile, from one remote village to another to keep the disease at bay. Complacency would result in dire consequences, the Sunday Times learns, for bitter are the lessons of the 1960s, when hopes of near-elimination were crushed, like a mosquito being squashed by a human. A look into the malarial-abyss that the country slithered down would help put the jubilation into perspective, while also acting as a warning against resource-cuts, health personnel’s attention being diverted to other and so-called more pressing scourges such as dengue and letting down the guard of vigilance and constant surveillance. With malaria dubbed one of Sri Lanka’s “most devastating” health burdens, mapping has indicated that only six of the 25 districts had low to no risk. In all other areas, the Anopheline species have been spreading the infection with the primary parasites P. vivax and P. falciparum. The malaria-saga saw the 1934-35 epidemic killing more than 80,000 people (1.5% of the population at that time), but the launch of the Global Malaria Eradication Programme dramatically reduced the numbers to just 17 (of which 11 were imported) by 1963. However, a massive epidemic erupted once again like a volcano, bringing forth between 1967 and 1970, about 1.5 million cases. The battle against malaria has been long and difficult, waged in remote homes, temporary Army camps in the jungles and in pools of stagnant water left behind by the drought in the dry riverbeds or stone quarries especially in the Dry Zone. “Morning and night, we have been alert, whenever we have had even a single case of imported malaria,” says Dr. Premaratne, lauding the Technical Support Group led by Prof. Kamini Mendis (former WHO Coordinator of Malaria Treatment and Malaria Elimination) for their unstinting support throughout. The reduction of local cases to zero since October 2012, shows Sri Lanka’s capability, for we are the only malaria-endemic country in the major tropics to eliminate the disease, he points out. This is why the whole world is talking about the example set by Sri Lanka, which has been featured in a large number of international newspapers and prestigious journals including the Lancet. Dr. Khetrapal Singh, meanwhile, says that this is testament to the courage and vision of its leaders and signifies the great leaps that can be made when targeted action is taken. It also demonstrates the importance of grass-roots community engagement and a whole-of-society approach. “Sri Lanka’s road to elimination was tough, and demanded well-calibrated, responsive policies. After malaria cases soared in the 1970s and ’80s, in the 1990s the country’s Anti-Malaria Campaign adjusted its strategy to intensively target the parasite in addition to targeting the mosquito. The change in strategy was unorthodox, but highly effective,” she says. Mobile malaria clinics in high transmission areas meant that prompt and effective treatment could reduce the parasite reservoir and the possibility of further transmission. Effective surveillance, community engagement and health education, meanwhile, enhanced the ability of authorities to respond, and mobilised popular support for the campaign. The adaptation/flexibility of strategies and support from key partners such as WHO and the Global Fund to Fight AIDS, Tuberculosis and Malaria fast-tracked success. By 2006, the country recorded less than 1,000 cases of malaria per year and since October 2012, the indigenous cases were down to zero. Now that Sri Lanka has run the gauntlet of the different phases in the elimination process, such as ‘Control’, ‘Pre-elimination’, ‘Elimination’ and ‘Prevention of Re-introduction’, Dr. Premaratne echoes Prof. Mendis’s advice that the country should not make malaria a forgotten disease, for then it will come back for sure. Dr. Premaratne was the Health Ministry’s National Coordinator for Preparation for Malaria Free Certification. The AMC had been assisted in its journey to the milepost of elimination by Sarvodaya and the Tropical & Environmental Diseases and Health Associates (Private) Limited – TEDHA. Future challenges, the Sunday Times discusses with AMC’s Regional Officer in Anuradhapura, Ravindra Jayanetti, who joined the battle against malaria way back in 1989 when he was 29 years old. Real are the challenges, the Sunday Times learns, for the disease can return to the country with ‘high-risk’ groups, the list of which is long. It includes Sri Lankans who fled to India during the conflict but are returning to settle down in the north; those who go on pilgrimage to India; people from neighbouring India who surreptitiously work in the northeast and the north-central areas; businessmen including gem merchants who go to other countries including those in Africa; and asylum-seekers. A saving grace though is that Sri Lanka is an island without land borders, it is learnt. As a young man, Ravindra’s first ‘posting’ was to Ampara where areas such as Dehiattakandiya were being opened up for paddy cultivations and people being brought from the hill country but having no natural immunity against malaria, being settled there. With the thick jungle being cleared, the mosquitoes which had been feasting on animal blood began targeting easy human-prey. Travelling long distances of 100km, deep into the paddy hinterland, Ravindra saw the pitiful plight of these settlers. They were not vulnerable to one attack but many, for these areas were endemic. He vividly remembers a farmer telling him that if all the tablets he had taken for malaria were ground to a powder, he could have made 10 rottis with it. Later, the conflict also made some areas inaccessible and he had to seek help from the Army. He creates a profile of the mosquito which spread malaria – a sun-loving species which found ideal breeding spots among emergent vegetation in stagnant pools. When rivers and streams dried up during the dry season or drought leaving little stagnant pools all over, they loved it, moving to agro-wells and stone quarries during the rainy season. The campaign against malaria mainly included indoor residual spraying to catch adult mosquitoes which had found safe havens on home walls and roofs and to a lesser extent larvicide-spraying to kill the larvae emerging from the eggs in water bodies. People were also encouraged to sleep under insecticide-treated bed-nets. Taking up her appointment in 1985 as AMC’s Regional Officer in Hambantota, Lalanthi Peiris, was in shock when she saw her office in a corner of the hospital which had been built during the time of the famous British civil servant Leonard Woolf. Bits and pieces from the roof would suddenly drop onto her table. Mustering support, from several Public Health Inspectors, she was able to get some government land and build an office for the AMC. “Ammo,” she says, recalling how Hambantota was a hotbed for malaria and she would jump into a rickety Land Rover to make her village rounds, covered in a layer of dust. Saree she wore then and saree she still wears while she is on duty, visiting village homes, for the words of a former Director were loud and clear: Gavum kota edan gam walata yanna epa (Don’t wear mini-skirts to villages). The Lunugamvehera project had just been opened up and a large network of irrigational canals from the Kirindi Oya were feeding the area. The settlers had put up simple wattle-and-daub huts with cadjan-thatched roofs, providing the ideal home for the malaria-dealing mosquito. People from Tissamaharama, Lunugamvehera, Suriyawewa and Hambantota were easy targets for the female mosquito to take a drink of blood and leave the malaria parasite behind. Patients would have violent bouts of shivering with high fever, followed by heavy sweating. But they just did not have the wherewithal or the time to seek treatment at the hospital which was difficult to reach. So they languished at home. Just like Ravindra and Lalanthi, across the country AMC workers soldiered on under severe hardship. When the elimination phase was declared in 2009, out broke an epidemic at Yala. 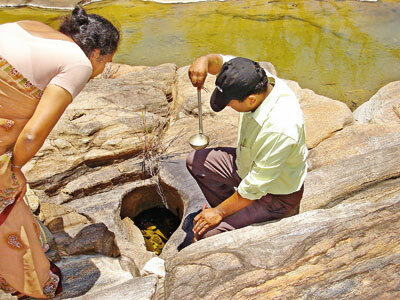 Soldiers from all over the country who were engaged in the last stages of the war in Kilinochchi and Mullaitivu were returning to camps deep within the Yala jungles and bringing with them an unwelcome intruder – the malaria vector, making the Menik Ganga the No. 1 breeding spot. Lalanthi and her team sprang into action with the ready support of the camps’ Commanding Officer (CO) spraying the areas, providing bed-nets and also taking the soldiers’ blood for screening and providing medications in the field itself for the nearest hospital was 25km away and the mode of transport was tractors. “But there were no reductions in the patient numbers,” she says, for the soldiers were trudging to a camp at Kumbukkan Oya close to the Ampara border and were not sleeping under the bed-nets but sitting on the banks of the oya. The only option was to spray the pools along a lengthy 36-km stretch, with the help of bands of soldiers from each of the camps bordering the oya. The soldiers who were contracting malaria were also not keeping to their medication regimen and the CO, on the advice of the top brass of the AMC, came up with the solution that once the soldiers were discharged from the hospital, they would be kept in the camps, ensuring that they took the full course medication, before they were sent home on leave. Lalanthi also sees as the turning point towards victory over malaria the deployment of mobile clinics which were able to reach every nook and cranny, carrying equipment to take blood specimens and microscopes as well as medications to be distributed to those whose blood tests came out positive, at their own doorstep. Overjoyed at getting certification on the elimination of malaria, Lalanthi says she has served her country and can die in peace now. This would hold true for the AMC’s more than 1,000 employees and Sri Lanka needs to salute each and every one of them, from the highest level to the humble spray-men who shouldered the spray-machines to win this war against malaria. Lankan at centre of Timor-Leste malaria control programmeCoincidentally, it was last year in Timor-Leste during the 68th RC Meeting that there was much talk about how that country cut the number of malaria cases through its strong control programme.And at the centre of this National Malaria Control Programme is a Sri Lankan. Soup ladles bought from the local supermarket and microscopes taken back to Timor-Leste from her trips home to Sri Lanka helped Dr. Manel Yapabandara to carry out entomological surveys. “I also sewed my own mosquito traps using netting material bought in the market,” says Dr. Yapabandara, WHO’s Technical Advisor on Malaria in Timor-Leste. She is quoted in the publication ‘Making a difference – WHO in South-East Asia Region’ as stating that in 2006 when she started work with WHO on malaria control as a consultant, they had no equipment for such surveys and only two full-time staff in the Health Ministry for such work. Commending the “ingenuity and perseverance” of Dr. Manel and her counterparts in the Health Ministry, the publication adds that within only six years the number of reported malaria cases in Timor-Leste dropped from 220 cases per 1,000 people in 2006 to less than 1 case per 1,000 in 2013. Dream big, major science forum urges Govt.